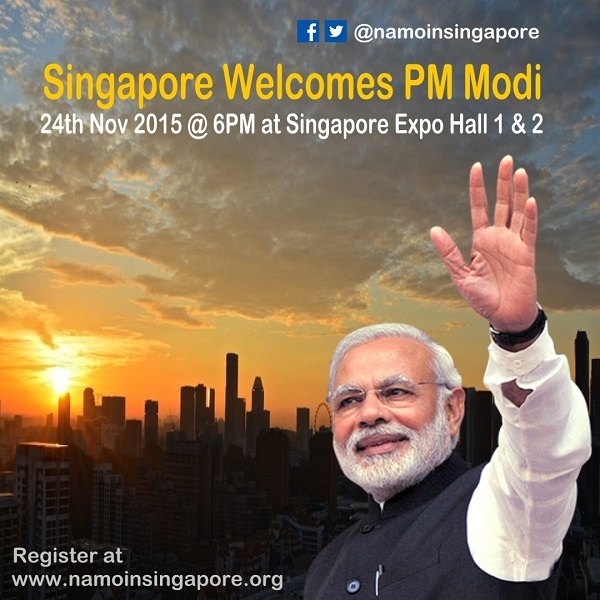 “Singapore NRI Forum” representing the Indian NRI community in Singapore is organizing a Community Reception for Hon’ble Prime Minister Modi during his visit to Singapore on the evening of 24th November 2015 at the Singapore Expo. Singapore NRI Forum representing the Indian NRI community in Singapore is organizing a Community Reception for Hon’ble Prime Minister Modi during his visit to Singapore on the evening of 24th November 2015 6PM to 9PM at the Singapore Expo all 1 & 2. “GsvTec Pte Ltd” has already been registered as a Oranization(Code 067). You will need to select “GsvTec Pte Ltd” as part of the registration process in addition to your particulars which are mandatory as this is a high security event.Note that this direct registration through this link is meant ONLY for NRIs. Please note that this registration is only an expression of interest to attend the event and it doesn’t guarantee an entry pass. You may have to reconfirm your participation closer to the date and entry passes will be issued subject to availability of seats at that point in time. The organisers will make all arrangements in accordance with the regulations and stipulations conveyed by the Government of Singapore and all participants need to strictly adhere to the local laws and the guidelines issued by the organisers. If you have any questions or clarifications, please call Sudhir 92203666 or write to info@gsvtec.com who will guide you.